I was recently asked a simple question by a friend, “how did you get into the Salmagundi Club?”. True to form, I told them that, first, I flew to New York then I took a cab to 47 Fifth Avenue. But that’s just me. That was obviously not what the question was asking about. It was more about how were you accepted into or juried into a competition that would “get you in”. 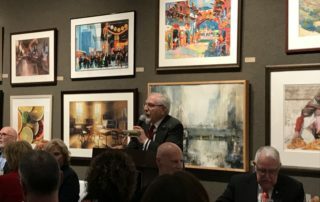 The Salmagundi Club in the East Village in Manhattan has been a fixture in the American Art world since 1871 when it was founded. It has a long history in the arts and home to many arts organizations and is presently the home of the American Watercolor Society. 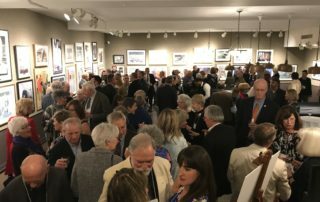 The American Watercolor Society (AWS) is the preeminent watercolor society in the world. 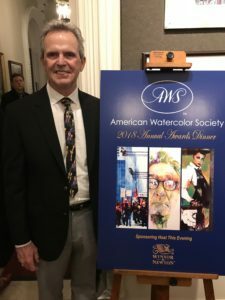 There might be a debate about this by other watercolor societies, but the American Watercolor Society wins in a draw because it has been around since 1866, even before the Salmagundi Club was founded. The question stays unanswered, how did I get into the Salmagundi Club in April 2018. It started in the winter of 2014. 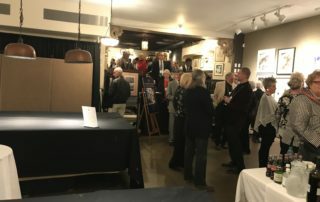 I’m a watercolor painter and had completed a solo exhibition in Akron and was continuing my paintings of urban landscapes. I referred to my digital library and chose a street corner in Manhattan at 42 street. Earlier attempts of such a scene had not produce a successful result. I have many “starts” like this but took a different tack on this try. Things seemed to be working this time and I ended up with something that I was proud of. The painting continued in the theme of Rush Hour. I named the painting Rush Hour III. It was the third in the Rush Hour Series. The painting received praise and awards in several local, regional, and state competitions although it was not accepted by the AWS jury in 2015. Needless to say, I was disappointed. But, I am not a quitter. I had an inkling that the painting had a chance. I entered the 2017 exhibit. 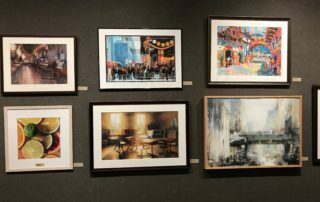 My email reported in January that Rush Hour III had been accepted and would be part of the 151st International Exhibition of the American Watercolor Society. I was please. More than that, I was happy, even more than happy. So, fast forward to April 2018. I followed all the rules for compliance with exhibit policy and conditions. I packaged and shipped the painting and checked that it made it to the shipping destination. I made my dinner reservation for my wife and I for the April 27 awards dinner. I knew that many of the luminaries of the watercolor world would be in attendance. I wanted to mingle with the best of those working in the watercolor medium. 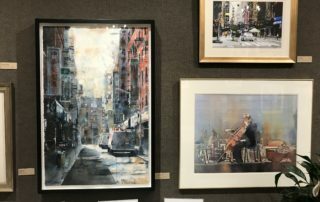 I arrived in New York the day before the awards dinner and used public transportation to get to the Salmagundi Club to get a preview of the exhibit. I knew the awards event would be packed with artists and guests. I was looking forward to an unobstructed view of the exhibit. 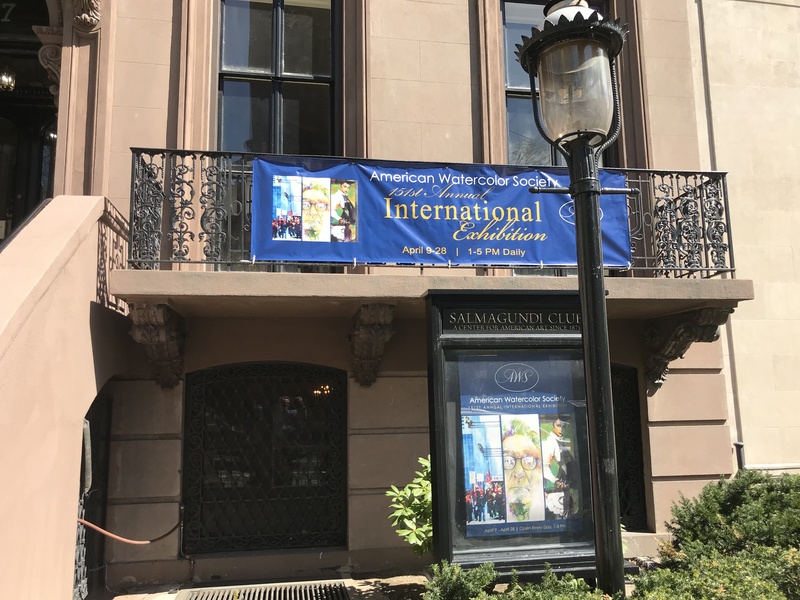 But, to my surprise, when I arrived at the Salmagundi Club that day, the marquee poster and advertising banner had something more to celebrate. There for all to see was a collage of three of the paintings in the exhibit. One of the paintings was Rush Hour III. So, walking up the Brownstone steps to the exhibit was like walking on a cloud. 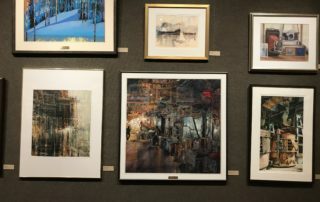 As expected, the exhibit was an exquisite display of the best of the best in the watercolor world. 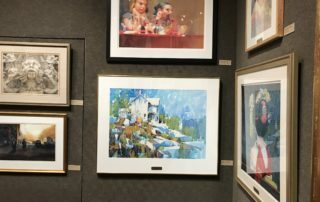 Paintings by watercolor celebrities were there including, Salminen, Webb, Mitchell, Hollerback, Graff and many more. My painting was mingled in with them. I was proud and said so to one of the officers of AWS present that day. I also commented to him about the promotional material that employed my artwork. He was such a gentleman and a nice man to talk to as well. He even went so far as to offer one of the posters to me. I was speechless. But I accepted the rolled-up poster and made my way to the UPS store so I could ship it home before it was damaged. It is now in safekeeping at my home studio to ever memorialize my trip to the Salmagundi Club in 2018. The reception and awards dinner made for a pleasant affair where I was able to take a few photos for history. Not sure when I’ll get back there, but I have somethings to help me remember my trip to the Salmagundi Club in 2018.